Tailored Accounts is a renowned accounting firm based in the heart of Canberra. It offers a range of accounting services, including management, accounting and compliance tasks, business consulting advice, and cloud integration solutions. Already, these have been beneficial to more than 500 companies and not-for-profit organisations throughout Australia. A reason for our continued excellence is our commitment to continuously update our staff's knowledge and skill. At Tailored Accounts, all employees receive a one-day training seminar at the end of each month. This program is designed to keep accountants on the forefront of accounting skill and innovation, whilst maximising their leadership and customer relations management. 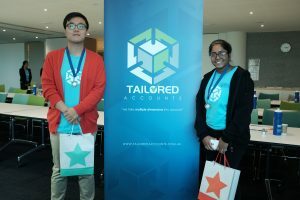 In January 2017, the CEO of Tailored Accounts, Harry Hoang, initiated a new program where the monthly training seminars were available to Canberra university students as well. This came from his conviction that business and accounting students should have an informed,realistic picture of the Accounting industry, both now and in the future. The team at Tailored Accounts chose to name the training initiative 'AccountantChange', designed to help students explore the world of accounting both locally and on a global scale. So, what does an AccountantChange training session look like? AccountantChange is a one-day seminar held in each quarter, including many speakers and workshops teaching leadership, technology, accounting software and general skills. The sessions discuss strategic decision making, career advancement in accounting and business, artificial intelligence and the future of accounting industry. AccountantChange has received a lot of support from universities, industrial leaders and experts, both in Canberra and interstate. 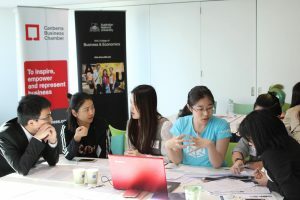 AccountantChange has welcomed many outstanding guest speakers as well as promotional supporters from the business and academic community here in Canberra. So far, AccountantChange has welcomed more than 160 students from the Australian National University, University of Canberra, and other institutions. Get ready to be an accountant - Tailored Accounts senior accountants & visiting experts will provide 3 hours insight technical training about certain accounting topics. For example, Payroll, Bank reconciliation, BAS & GST, Payment Summaries, Reporting, Setup & conversion, Tax, Auditing, Restructuring, Financial Planning. What you should know as a future accountant - Introduction to current changes in the accounting tools (Xero, Quickbooks) and techniques (i.e. software & add-on landscaping). How to be successful in your accounting career - Guest speakers will share their career insights and give advice to improve your people skills ? Enhancement of your accounting knowledge and skills: Better understanding of accounting procedures in the real working environment. Access to the career and industry insightful resource. AccountantChange participants will be connected to like-minded people with forward thinking and inspiring technology to change the way future accountants work. Great opportunities to network with successful ANU, UC alumni and current ANU, UC accounting students.